There's something not quite right about sending a movie writer to cover what the director is calling a "visual album." Sure I can tell you about how music works in a film, but when it comes to critiquing music itself, and a movie built specifically to go around that music instead of vice-versa, I'm a lost cause. So I'm not really sure if the Animal Collective and Danny Perez collaboration ODDSAC is genius or insane or some combination of the two, or the if the low-fi hallucinatory visuals here represent some great leap for music movies-- I'll leave that to Pitchfork to sort out. What I do know is that ODDSAC definitely doesn't look like anything I've seen at Sundance, or maybe even in my life, and at its best moments captures some of the aural layers and intensity of the band's music itself. If you're going for "visual album," I'd say that's pretty good. Featuring more humans and deliberate "scenes" than you might assume looking at the cover of Animal Collective's newest album, ODDSAC is something like an ramble through the terrifying, surreal sides of nature, starting with a girl in a rural house being terrorized by approaching fire spinners, veering over into sinister-looking rocks at waterfalls and a vampire melting in a marsh, then concluding at the same house, where nature seems to have stopped menacing people long enough for them to have a joyful food fight. There are moments of abstraction as well, including what appear to be close-ups of the spinning fire in which astonished, bearded faces emerge (maybe reflecting the ultra-hip audience?) and about five minutes of colorful abstraction that fall somewhere between TV static and the iTunes visualizer... but in a good way. You can tell words are failing me here about the visuals, and I'm even more hard-pressed to describe the music, which veers occasionally into what one of the members called "songy" but more often resembles a sonic wall, taking cues from the terrifying visuals on the screen and overwhelming us. The power of the music encourages you to succumb and stop looking for story in the visuals, and then suddenly turns up the volume and intensity to scare the hell out of you-- some of the faces that emerged from the layers of color and swirls will surely haunt my dreams. ODDSAC surely cements Animal Collective's place at the forefront of avant garde indie music, maybe counteracting Merriweather Post Pavilion's more mainstream, accessible feel (the movie has been in progress for four years, a time during which the band's music has shifted drastically). 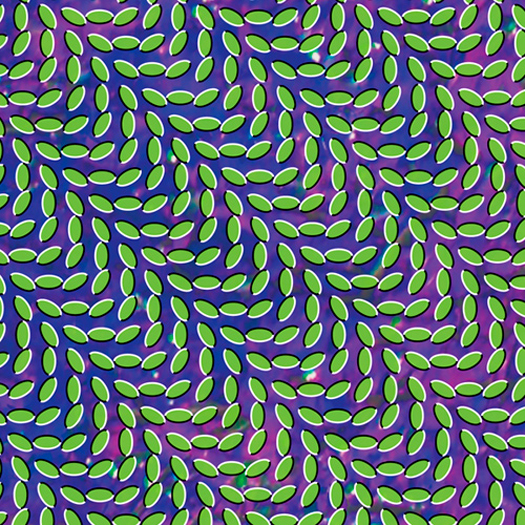 I can see the movie playing exceptionally well for the hip urban audiences who sell out Animal Collective shows in minutes, particularly given how well the band has incorporated Perez's visuals into the stage shows in the past. You do miss something by not watching the live collaboration of the band, but then again, stage shows don't usually feature footage of marshmallows eating a family on a camping trip. Both playful and terrifying, ODDSAC feels like a natural extension of Animal Collective's work-- as well as reminding me of the fever hallucinations I had as a child. It's a powerful combination, I can promise you that much.